bonding with dozens of passionate paper crafters just like you! Ample table space available for you to work on your projects for the day - bring your latest crafting projects/kits or sign up for our optional classes! 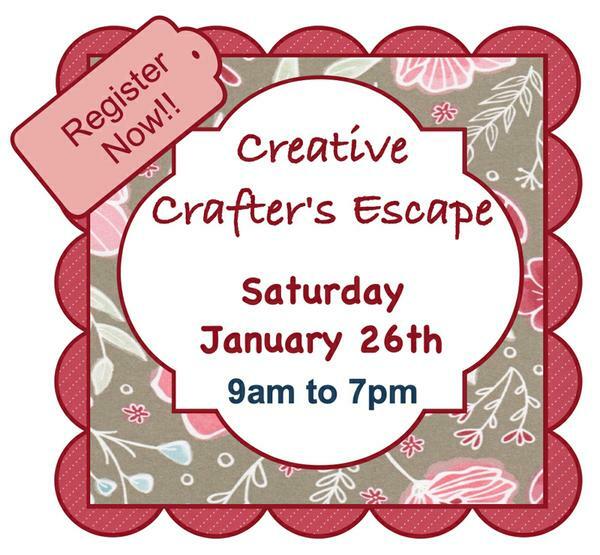 Fun games and fellowship with other crafters thoughout the day! Enter Raffles to win prizes! Earn Raffle tickets at the event and with registration. Grand Prize - to be determined depending on new products that will be unveiled in April 2018! Register Today (registration only open until January 9). For more information, or to register, contact me at stampwithjeannie@gmail.com. Creative Crafter's Escape is brought to you by Jeannie Nielsen and Marilyn SanClemente. Both are Independent Stampin' Up! Demonstrators that have a combined 25 years of Crafting experience!